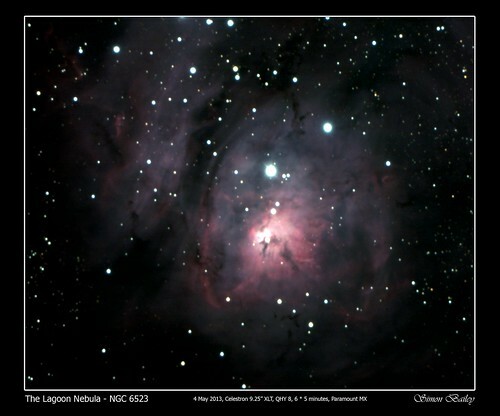 The Lagoon Nebula (catalogued as Messier 8 or M8, and as NGC 6523) is a giant interstellar cloud in the constellation Sagittarius. 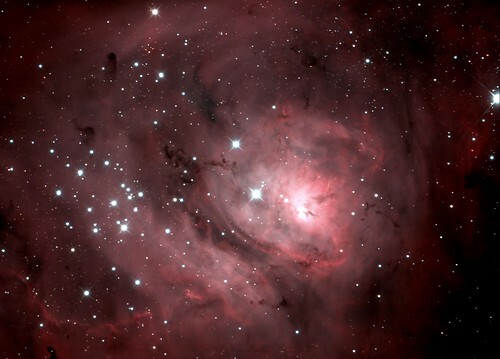 It is classified as an emission nebula and as a H II region. 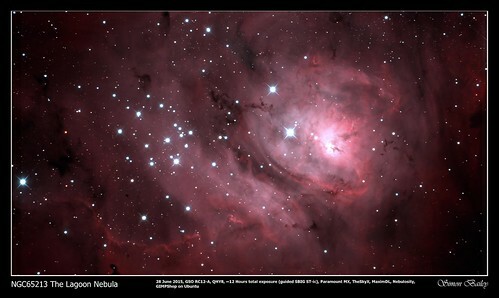 The nebula contains a number of Bok globules (dark, collapsing clouds of protostellar material), the most prominent of which have been catalogued by E. E. Barnard as B88, B89 and B296. It also includes a funnel-like or tornado-like structure caused by a hot O-type star that emanates ultraviolet light, heating and ionizing gases on the surface of the nebula. This creates a structure known as the Hourglass Nebula (so named by John Herschel). Taken with a GSO RC12-A, approximately 12 hours of exposure guided with an SBIG ST-ic using off-axis guiding on a Paramount MX. 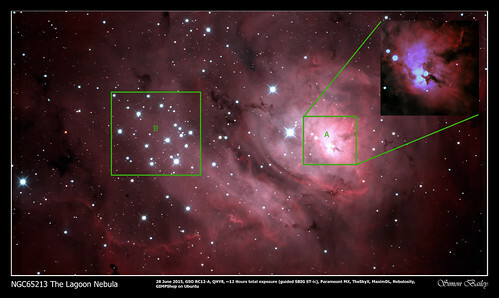 Data captured with Nebulosity, post processing with MaximDL, Nebulosity and GimpShop on Ubuntu.